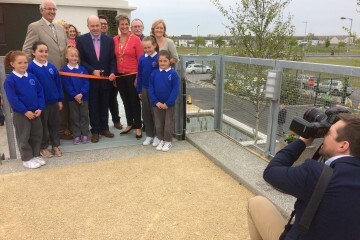 Eurpoe’s first purpose built 3D Textbook was officially opened by Minister Denis Naughten TD, Minister for Communication, Climate Action and Environment at the Rediscovery Centre on Thursday the 11th of May at 3pm. RTE Presenter and Biochemist Dr. Jennifer Cleary was MC at the event. The original boiler house, which served the residents of the old Ballymun Flats for many years, has undergone a major green revamp thanks to a successful application from Dublin City Council and The Rediscovery Centre to the EU’s LIFE+ Programme. The building has many features designed to conserve precious resources and demonstrate the latest research with regard to environmental sustainability. All systems are visible and labelled from start to finish giving the viewer an insight into the working of each process. The repurposed Ballymun Boiler House is now the new HQ of the Rediscovery Centre – and is a creative space connecting people, resources and ideas. It contains creative workshops, an ecostore, education, training, events space and green cafe exemplifying reuse & sustainability. The Centre provides successful community training programmes for local long term unemployed people and those distanced from the workplace. The Centre runs four social enterprises: Rediscover Fashion, Rediscover Furniture, Rediscover paint and Rediscover Cycling. The Rediscovery centre also operates an active research centre and delivers an extensive education programme at all levels including interactive environmental and STEM workshops and has become a leading example in the field of innovative efficiency and waste prevention. Earlier this year the project was awarded The Green Construction Award of 2017 at the National Green Awards. Sponsored by Ecocem, the Green construction award recognises sustainable development through innovative construction methods, sustainable use of resources and a design that prioritises the needs of the wider environment and society. The completion of this project has resulted in the preservation of an iconic and historical building, the provision of necessary waste infrastructure for the region and the creation of local employment. The project has been funded by the EU LIFE+ Programme under the WISER Project, The Department of Communication, Climate Action and Environment, The Department of Housing Planning, Community and local Government, Dublin City Council and the Rediscovery Centre. Working with the WISER project team, ABK Architects were responsible for the design and Purcell Construction completed the construction.